The Inglot Freedom System Rainbow Eye Shadow retails for $9US or $12CAN for 2.5 g/0.09 US OZ or 2.8 g/0.10 US OZ of product each. I purchased these at the new Inglot store in Toronto compared to placing my orders in Poland in the past. 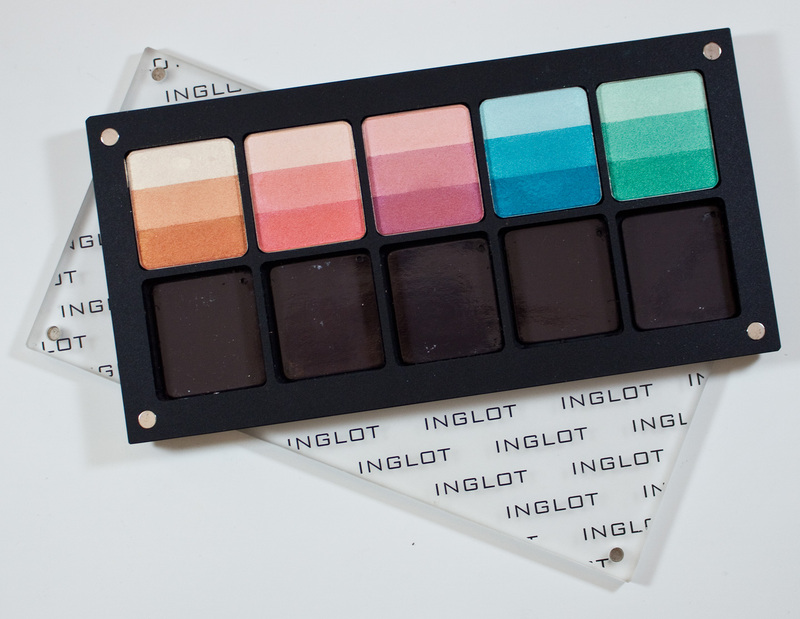 Inglot Freedom System Rainbow Eye Shadow in 131R, 132R, 133R, 134R, & 135R in blister packs. 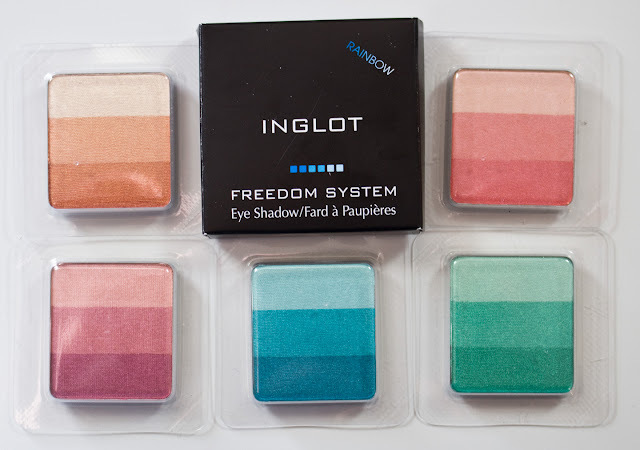 Inglot Freedom System Rainbow Eye Shadow in 131R box. Inglot Freedom System Rainbow Eye Shadow in 131R blister pack. Inglot Freedom System Rainbow Eye Shadow in 131R, 132R, 133R, 134R, & 135R. Talc, Mica, Polyethylene, Titanium Dioxide, Lauroyl Lysine, Zinc Stearate, Aluminum Hydroxide, Nylon-12, Polymethylsilsesquioxane, Hdi/Trimethylol Hexyllactone Crosspolymer, Caprylyl Glycol, Boron Nitride, Phenoxyethanol, Hexylene Glycol. [+/- (May Contain): Methicone, Polyperfluoromethylisopropyl Ether, Red 40 Lake (CI 16035), Yellow 5 Lake (CI 19140), Blue 1 Lake (CI 42090), Carmine (CI 75470), Ultramarines (CI 77007), Black 2 (CI 77266), Iron Oxides (CI 77491, CI 77492, CI 77499), Ferric Ammonium Ferrocyanide (CI 77510), Manganese Violet (CI 77742)]. 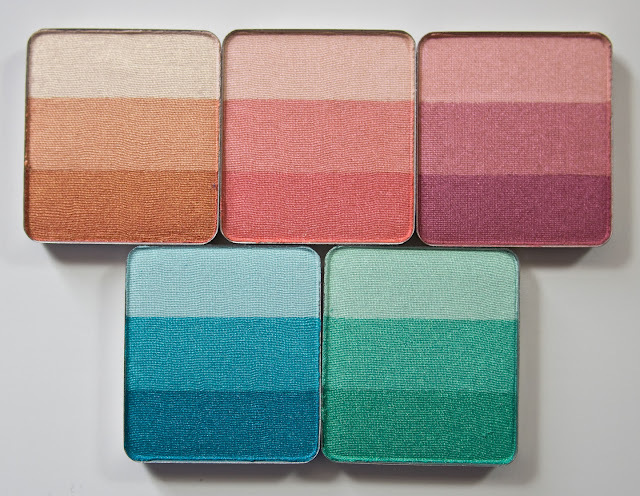 These shades of Rainbow eyeshadows are in a satin/pearl formula with excellent pigmentation and is smooth in texture. The pearl used in these shades is an aura/iridescent mica pigment and the same shade of mica is used in all 3 stripes in a single pan. 131R has the yellow/gold, 132R & 133R has the red/pink/orange one, 134R has the aqua one, and finally 135R has the green mica one. 131R #1 is a sheer pale gold with a pearl finish. 131R #2 is a goldenrod orange with a pale gold pearl finish. 131R #3 is a bright orange with a pale gold pearl finish. 132R #1 is a sheer pale pink with a yellow base with a pearl finish. 132R #2 is a pale peach with a light pink pearl finish. 132R #3 is a light orange with a light pink pearl finish. 133R #1 is a sheer pale pink with a light pink base and a pearl finish. 133R #2 is a light rose with a light pink pearl finish. 133R #3 is a warm berry with a light pink pearl finish. 134R #1 is a sheer pale aqua with a pearl finish. 134R #2 is a light blue with a pale aqua pearl finish. 134R #3 is a bright aqua with a pale aqua pearl finish. 135R #1 is a with sheer pale green a pearl finish. 135R #2 is a light green with a pale green pearl finish. 135R #3 is a seafoam green with a pale green pearl finish. Packaging: Simple magnetic rectangle pans with rounded corners that are housed in a blister pack inside a cardstock box. The freedom palettes have a single magnet in the bottom of each pan well and with magnets in the corners of the palette to keep the lid on or to stack the palettes together without the lids. Daylight Swatches: 131R - #1 #2 #3, 132R - #1 #2 #3, & 133R - #1 #2 #3. 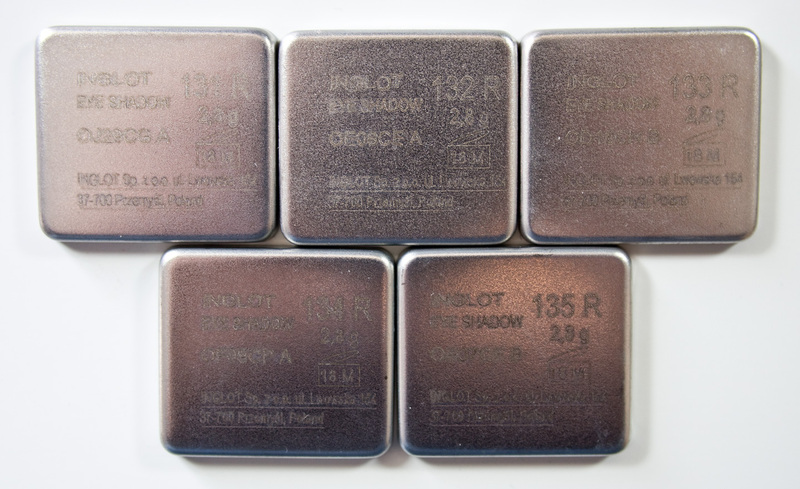 Flash Swatches: 131R - #1 #2 #3, 132R - #1 #2 #3, & 133R - #1 #2 #3. 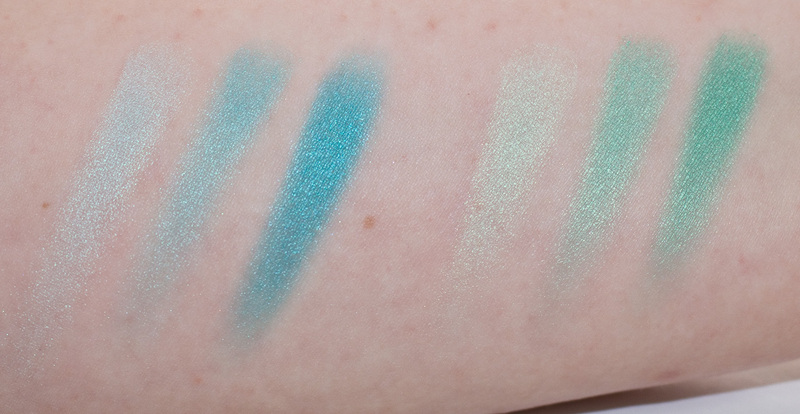 Daylight Swatches: 134R - #1 #2 #3, & 135R - #1 #2 #3. Flash Swatches: 134R - #1 #2 #3, & 135R - #1 #2 #3. 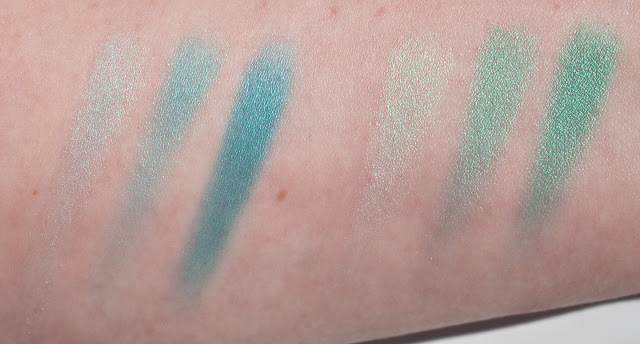 These are gorgeous and give you a nice range of options with the use of Aura/Iridescent mica as the use the same colour for each stripe in the pans. If you think you want to splurge on these I highly recommend them for anyone eyeshadow collection.